The Sports Medicine program prepares students to pursue work as a fitness trainer or go on to earn an advanced degree in athletic training, wellness, kinesiology, or physical therapy at a four-year university. Students who complete their program through the EAC could earn national certification as an ACE personal fitness trainer or test for certifications as a physical therapy aide or massage therapist. Where Do Sports Medicine Graduates Work? Students who complete our sports medicine track may find work in fitness clubs as a class instructor or personal trainer, within the athletics department of a school district or community recreation program, or at a rehabilitation unit. A three-credit class that examines the relationship between nutrition and the human body including eating habits, food selection, nutrition components and assessments, and eating disorders. 3 credits. A three-credit introductory course for the athletics trainer. Includes emergency care and training room procedure. 3 credits. Discover the basics of life support and emergency medical procedures in this two-credit course. 2 credits. Another hands-on credit of sports medicine and rehab techniques. 1 credit. Intro to basic aerobic fitness principals and the creation of a fitness program. 3 credits. A three-credit course that introduces the structure and vocabulary of physical anatomy and includes common anatomical conditions seen in sports medicine. 3 credits. Clinical observation of post-trauma recovery and sport-specific interventions. 1 credit. Examine the psychological factors between sports performance and coaching behavior and the effect that exercise has on the brain. 3 credits. Three credits evaluating student competencies in athletic training, injury prevention, and nutritional competency. Includes the assessment and care of injuries and therapeutic exercise. 3 credits. In this course, students learn how the body functions and about health issues such as maintaining and/or improving health and preventing disorders and disease. 3 credits. This three-credit course is an introduction to the disciplines and professions associated with exercise science, including physical education teachers, athletic trainers, and rehabilitation specialists. 3 credits. 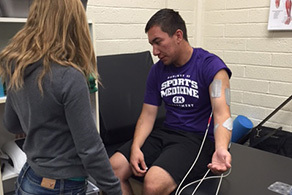 Additional credit of hands-on sports medicine and rehab techniques. 1 credit. Class meets daily from 7:00 to 9:00 a.m.
Students enrolled in the Sports Medicine program through EAC may work towards their associate of arts degree. This degree requires a total of 24 sports medicine credits plus general education requirements and a GPA of 2.0 or higher. Students may earn a certificate in sports medicine and rehab therapy by successfully completing 32 curriculum credits and demonstrating mastery on both the EAC writing and math placement tests. Students will also sit for their personal fitness trainer test.